Where else in downtown Macon can you celebrate Hump Day with a mean game of trivia, have a burger with a fried egg on top or spend a lazy Sunday sucking pretty oysters on the half shell with a killer bloody mary . . . and leave with a container of Georgia-grown goat cheese? We've written about their infamous "Jessica" hotdog before. This time it was the Dr. John Burger, cooked medium with a medium egg mixing juices underneath the buns, that stuffed Mom's face. Served with a side of their new smashed potatoes, this is a dish with some serious boogie woogie. In fact, Mom still hasn't shut up about how good it was. Then there was this recent Sunday when Shuga caught wind they were serving oysters on the half-shell as a special. As soon as he and Mom were done cleaning up after the amazing Second Sunday Brunch concert, they cozied up in a booth and made room for the cocktails and cocktail sauce. One bloody mary and a dozen fresh oysters later, Mom declared it one fine afternoon. Welcome to the new Rookery. Owners Chad Evans and Wes Griffith are finding their stride as this downtown institution continues to rock and roll. 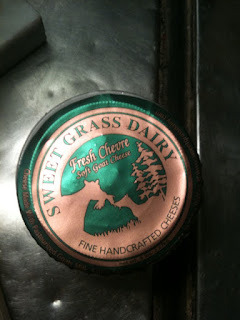 On top of their new menu offerings, the Rookery is now selling Sweet Grass Dairy Products. That means fine handcrafted goat and cow cheeses (to-go!) made from a family farm just south of Macon in Thomasville, Georgia. In fact, Mom came home carrying a container of Sweet Grass goat cheese that cheese heads like her could practically eat with a spoon. Mom is already looking forward to the next round of trivia, every Wednesday at 8 p.m. Prizes include Rookery and Vineville Salon gift certificates, and teams are entered to win an ultimate $5000 grand prize. Watch out for her team, the Monthlies. And for all of the cheaters who think they can cheat with the PDA, you've been warned. Real brain power is required.